Professor Bill Dunn received a bachelor's degree in electrical engineering from the University of Notre Dame in 1968 and master's and doctoral degrees in nuclear engineering from North Carolina State University in 1970 and 1974, respectively. He worked as an in-house nuclear engineering consultant for Carolina Power & Light Company in Raleigh from 1973 to 1977. In 1977, he returned to North Carolina State University as reactor applications engineer and assistant professor. He then embarked on a 23-year career in contract research, working for Research Triangle Institute from 1979 until 1982, Applied Research Associates from 1982 until 1988 and Quantum Research Services, Inc. from 1988 until 2002. He was founder, president, and board chair of Quantum. In 2002, Bill joined the mechanical and nuclear engineering department at Kansas State University as an associate professor. In 2003, he became director of the Radiation Measurement Applications Laboratory at K-State. In 2013, he was named acting head of the MNE department. In June of 2014, he was promoted to professor and assumed duties as the head of the MNE department, and the Steven M. and Kay L. Theede Chair in Engineering at K-State. Dunn’s research has been primarily in the areas of nondestructive evaluation, radiation applications, radiation physics, shielding, radiation effects, Monte Carlo simulation, and probabilistic risk assessment. He has been principal investigator on more than 35 grants and contracts funded by the National Science Foundation, Department of Energy, National Cancer Institute, Naval Surface Warfare Center, Defense Nuclear Agency, Strategic Defense Command, Environmental Protection Agency and several industrial sponsors. Dunn developed a technique to measure hidden flaws, such as corrosion and cracks, in structures. His “rolling-window template-matching” technology was incorporated into an X-ray scanning device that was tested at the FAA Airworthiness Assurance NDI Center at Sandia National Laboratory, and patented. From 2007 to 2012, Dunn developed, tested and patented the signature-based radiation-scanning technique for detecting hidden explosives. In the 1980s, Dunn was principal investigator on two contracts funded by the Defense Nuclear Agency to make use of shape and composition factors for minimizing shield mass. Minimizing mass is important in space applications and on tactical nuclear battlefields. Dunn and a colleague also developed a new and efficient model for X-ray fluorescence analysis. This model utilized the inverse Monte Carlo or IMC method, which Dunn had developed for other applications. Dunn also was involved in developing Monte Carlo codes to estimate the risk to nuclear power plants from high winds and tornado and turbine missiles. Dunn is co-author of the book Exploring Monte Carlo Methods and as well as the book chapter “Gamma-Ray Detectors,” Ch. 17 in Handbook of Particle Detection and Imaging, Vol. 1, Part 2, Specific Types of Detectors. He is author or co-author of four issued patents and co-author of a laboratory manual on radiotracer techniques. Dunn has published more than 30 conference abstracts and proceedings and 70 peer-reviewed publications. Twenty of his publications have been cited 10 or more times and his book has been cited 136 times. His Google Scholar H-Index is 13. 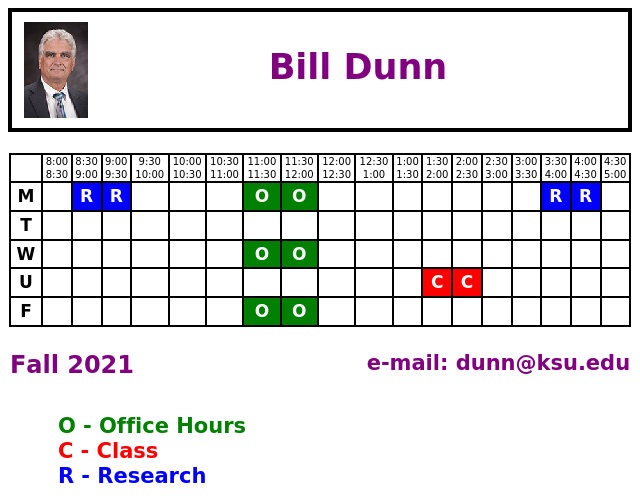 Dunn has taught 15 courses in nuclear and mechanical engineering at K-State and North Carolina State University. He has been general chair of three conferences and technical program chair of four conferences. Dunn was an executive council member, from 2005 to 2006, vice president for North America, from 2006 to 2012, and treasurer, since 2012, of the International Radiation Physics Society. He is an editor of the international journal Radiation Physics and Chemistry, and was on the editorial board of the journal Applied Radiation and Isotopes from 2004 until 2013. In 2015, Dr. Dunn was recognized with the Radiation Science and Technology Award by the American Nuclear Society.